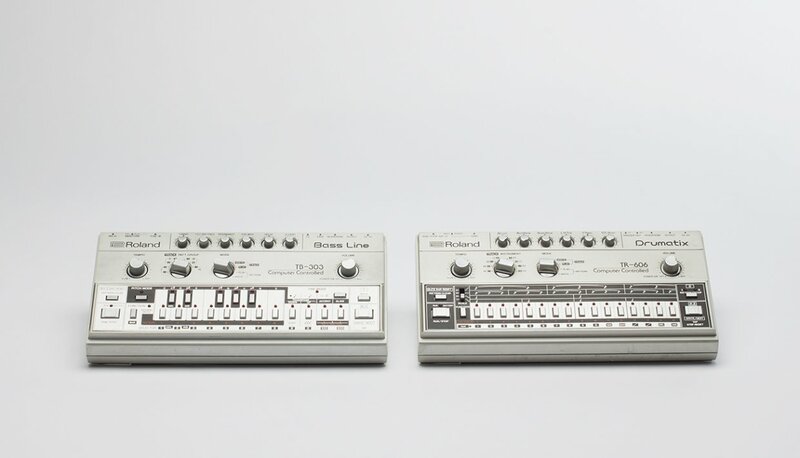 Modeselektor, Legowelt, Lee “Scratch” Perry and more star in R IS FOR ROLAND, a book dedicated to classic Roland machines. 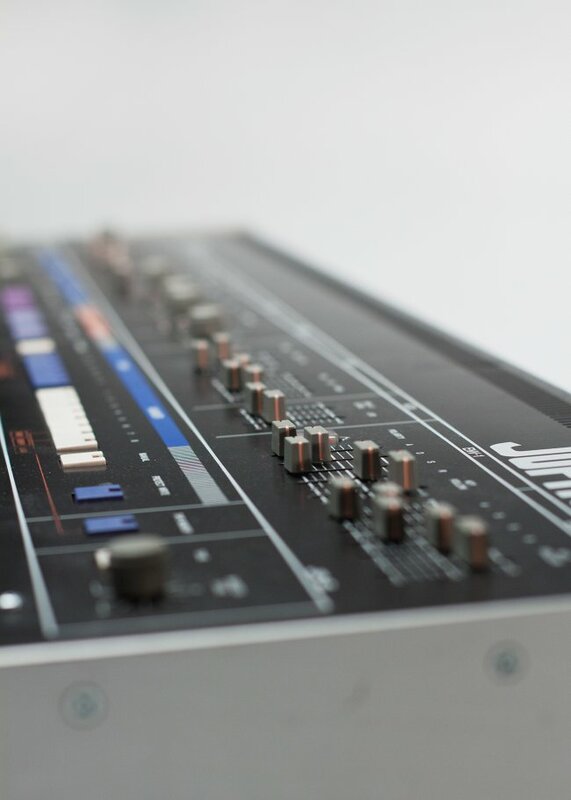 R IS FOR ROLAND is our latest collaboration dedicated to some of the Japanese manufacturers most famous and sought after analog pieces of gear. Its pages feature photographs and descriptions of classic Roland machines exclusively made for this book, plus interviews with Legowelt, Egyptian Lover, Mark Ernestus, alongside those from EB family members Modeselektor and Mathew Jonson. We met with Michal Matlak, who with Tabita Hub, were the brains behind this mammoth production. How did you come to be part of this project? How does one go from being a Roland fanatic to helping compile such a book? And how was it all made possible? Back in 2012 my girlfriend Tabita studied design and was talking about making a book. Through my charming skills I managed to convince her to base it on the Roland machines that I love so much. I’ve always been dedicated to vintage Roland machines, so it was a dream to have a kind of encyclopaedia with all my favorite instruments united in one book. Honestly, it wasn’t too hard to convince Tabita to go along with the idea, as she really loves the designs and sounds of the Roland machines in my collection. So we worked intensively for six months to create a dummy version of the book with help from our friend Florian Anwander, who’s a big Roland aficionado. This was back in 2012. In the meantime we’d moved to Berlin. 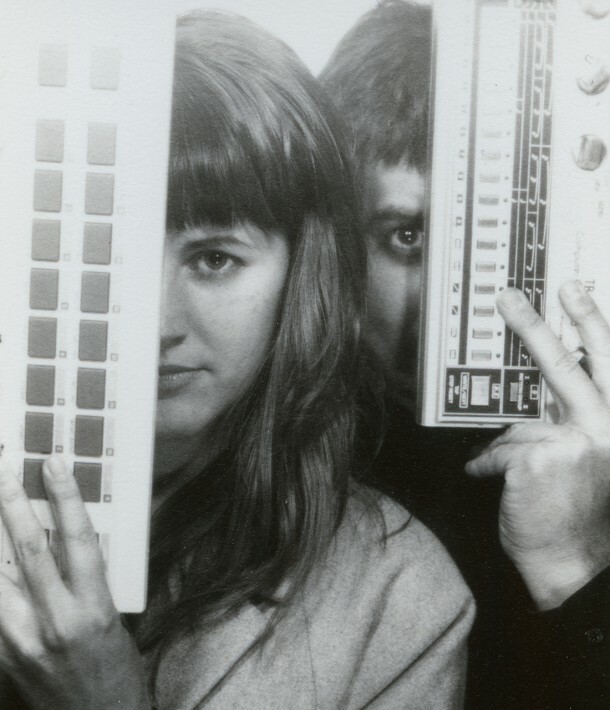 Tabita was studying photography and I continued my work as a musician and sound engineer, through which I became part of the Electronic Beats Slices Team led by Holger Wick. The Slices Team made a great video feature about my music project The Analog Roland Orchestra, so we knew each other already and stayed in touch. Eventually I showed Holger one of the two dummy books we made—it was love at first sight. He introduced it to EB HQ in Bonn, and a few days later I got a call from Electronic Beats saying “guys we love this book. Finish this project, and we’ll help you out.” Needless to say, we were blown away as we’d always dreamed of finishing the project and releasing it to a wider audience. Thanks to the support of Electronic Beats it was all possible. We completely reworked the book in one year, added around 200 pages, translated it into English and got some marvellous artist interviews. It’s funny how our paths crossed and how everything came together … all because of these vintage synthesisers! What’s the intent behind the book? 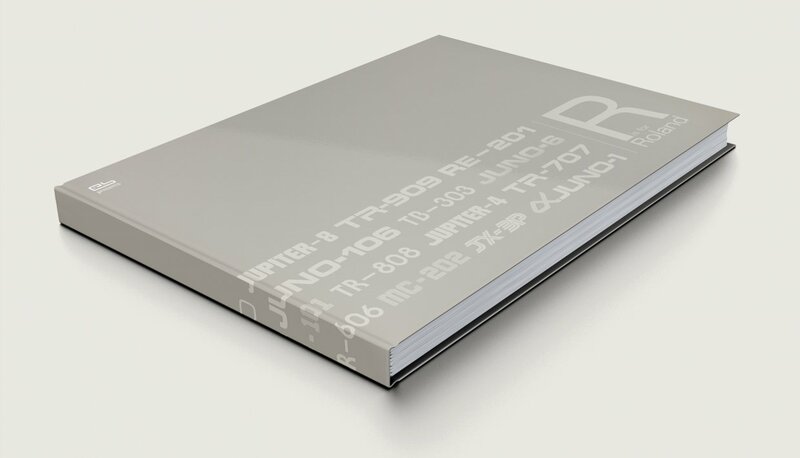 Is it a bible for synth nerds or something any music fan can enjoy? The classic Roland sounds are literally everywhere! It’s pure, living music history. We also wanted to pay tribute to Mr. Ikutaro Kakehashi, the founder of Roland. He’s a consummate business man and a very passionate inventor whose work shaped the evolution of electronic music across the decades. The book is for music lovers, musicians, producers and DJs who all share the same passion for timeless waveforms and sounds. There’s a lot of technical details but the prime focus is communicating personal points of view and experiences with these machines. This isn’t just for synth nerds but also their girlfriends and boyfriends, their husbands and wives. Roland is one of the most fetishised, mythologised and culturally omnipresent brands in electronic music. Films, books and innumerable articles have added to the mythos and economic value surrounding the brand. From what angle of approach does R is for Roland consider this considerable legacy? To create a fetish and mythologies you need to reach people and to create emotions. Roland did this mostly by accident, which is a fascinating point and key to their legacy. Of course they had the intention to sell their products like any other company—but some of their machines had totally unprecedented effects. The classic example is the TB-303 which was originally made to replace a bass player in a band. This machine was super difficult to program and it didn’t sound anything like a real funky bass player. Basically it was a commercial flop. Then somebody used it in a way that its designers had never intended, acid house was born, and this little plastic machine became the sound of a whole generation. In R is for Roland we chart these decisive events and look at the artists who helped make these machines such a huge part of music history. Each machine has its very own story and signature practitioners. So we have Jeff Mills on the TR-909, the Egyptian Lover on the TR-808, Mathew Jonson on the SH-101, and Lee “Scratch” Perry on his beloved Space Echo. "The 808 is the king of drum machines because nothing has lasted longer than it has. The sounds are analog passion. Nothing can compare. Long live the king! 808 Forever!" What was the process like of physically amassing and photographing so many machines? In the early stages we were students without a big budget, so it was mainly a question of time. We tried to focus on machines we could find without shipping—they’re pretty expensive treasures to hand to a courier. You’ll have a hard time finding anyone who will ship his System-100m or System-700 to two students he doesn’t know for a photo shoot. Forget it! On the other hand, we were lucky because a lot of our friends are also musicians and Roland fans who were happy to loan their machines for shooting. Bringing all those devices together was a pretty big task. I remember we were driving around Munich in our old rusty ’86 Volkswagen Polo with all this priceless gear in the trunk. 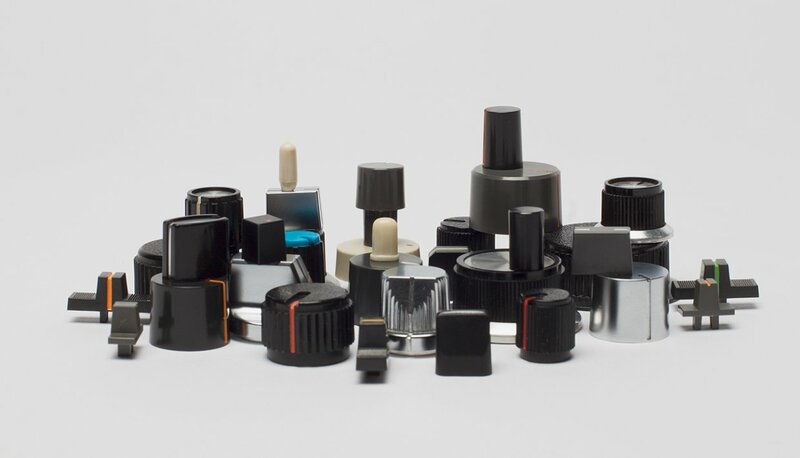 Imagine such a tiny car loaded with the creme de la creme of synthesizers and drum machines: a System-100, Jupiter-8, Jupiter-6, Jupiter-4, the whole TR-series, TB-303, SH-101, MC-202. As a photographer Tabita’s intention was to capture the beauty of the instruments in all their facets. Scratches, dents, dust and rust, the colors and shapes, lumps and bumps; it’s all part of the charm which adds to the peculiar character of these Roland classics. The finished book will be released on May 11th, 2015. 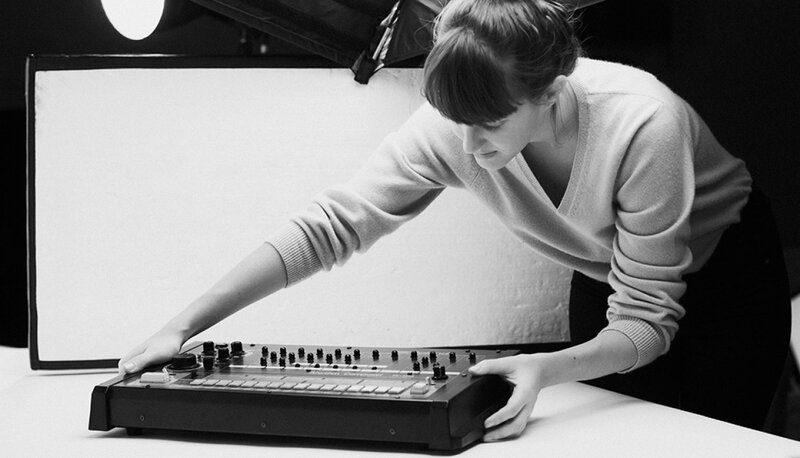 Tabita prepping a TR-808 for the book's shooting. 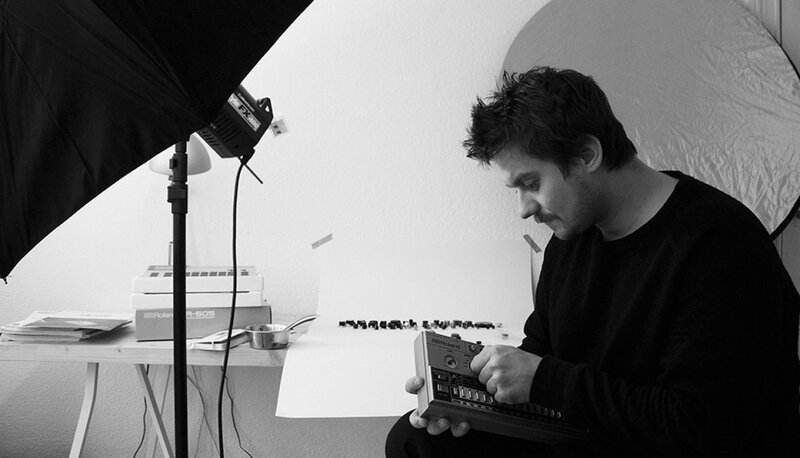 Michal making sure the TR-606 looks perfect for the shoot. Two legends – 303 and 606 – sitting side by side during the shooting. A rather eclectic collection of knobs, potis and various other Roland nuts and bolts. Was there any thing particularly resonant that you learned from any of artists featured in the book? Any new perspectives on a machine you thought you knew back to front? Definitely. I had the chance to talk to Lee “Scratch” Perry on the telephone while he was in Jamaica. It was one of the funniest conversations I’ve ever had. He and his wife Mireille are very cool people and we talked about the Space Echo RE-201. Lee has a very special point of view regarding how he handles the machines. They are extensions of his mind and soul. He becomes a machine and the machine becomes him. It’s a very spiritual approach which I never had in my relationship to the machines—until now. I respect my Space-Echo more than ever! There is definitely a spark of soul in each device. They’re not mindless tools. Do you think it’s possible for an instrument company to have a Roland-esque impact nowadays? For me personally, nothing can beat the Roland vibe and their signature sonic footprint. The Roland sound is a world of its own. These machines helped write electronic music history and people are really beginning to recognize their influence and impact. Who knows what an open hi-hat or a bass drum will sound like in 2080, but I wouldn’t be surprised if it was still coming from the 909. Are there any key tracks or artists you consider indicative of the appeal and legacy of the various Roland machines? In 1982 an Indian named Charanjit Singh recorded the album Ten Ragas to a Disco Beat with only a TB-303, TR-808 and a Jupiter-8. He already made “acid” four years before acid was born in Chicago. This was even before MIDI was invented. He synced all the machines with Roland’s own “din sync” system. That was a real arbiter of what was to come in the eighties and nineties. Any Lee “Scratch” Perry stuff released after 1974 is a Space Echo masterclass, with “Disco Devil” a case in point. Phil Collins’ “In The Air Tonight” is the CR-78 Track. Giorgio Moroder’s Scarface soundtrack shows the Jupiter-8 in all its glory. Larry Heard’s “Can You Feel It” features the ultimate Juno bass line. Finally, “Da Funk” by Daft Punk is a massive 303 track. The question “why Roland?” has been asked a million times. After decades of usage, have these machines maxed out their potential? If not, why? 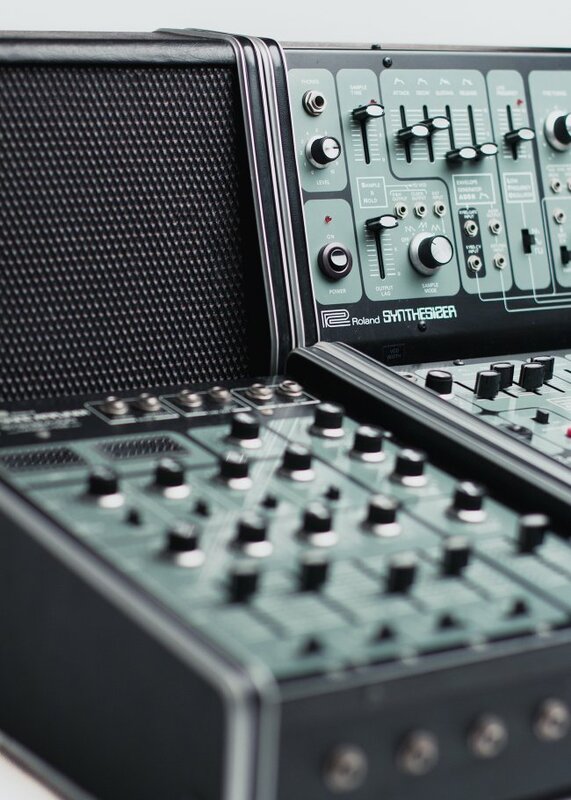 The beauty of the Roland sounds is simple: they’re timeless. I think it’s wrong to say that everything has been said and heard already from these old machines. There is still potential lying in each of the devices—you just have to dig a little deeper to create something personal. Nowadays we can tune, tweak, stretch and manipulate the sounds into something far beyond the original sources. And lets not forget about the design and structure of the instruments; there is barely a setting that sounds wrong. I don’t know how Roland did it. The interface of a Juno-6 for instance is so simple but completely hands on, which is vitally important for creativity. Roland provides so many approaches to getting the sounds you want in the way that works best for you. Everyone can find something useful. What do you make of the spate of reissued, updated classics? How do you think remakes of machines like the 808 and 303 are being used? For replication or something new? Well this is very personal and I think I’m a bit of a snob on this topic. I love the originals, and I always prefer to own and work with an original instead of a remake. I need the history, the scratches, the smell of old circuitry, these individual characteristics. The machines have something to tell and I like to listen to them and care about them … but that’s perhaps a little romantic. The dark side is that you spend a lot of time fixing or modifying the originals, and this is where reissues make a lot of sense to me. If you want to spend more time making music and less time paying for repairs, get the updated version of the 303. R is for Roland, a piece of art dealing with a piece of music history will be exclusively available via www.roland-book.com for 49,90 Euro in Germany and 59,90 Euro in the rest of the world. Postage and packaging included. To get you in the mood for some Roland synth sounds, we have compiled a comprehensive playlist featuring some of the most icon tracks ever produced on the fine machines featured in R is for Roland. Hit play below and enjoy. Like this? Let them know!